In a country where political crises are ignored by the government until they fade into oblivion, the families of the missing students of Ayotzinapa have kept their search alive for seventeen months. In a country where political crises are ignored by the government until they fade into oblivion, the families of the missing students of Ayotzinapa have kept their search alive for seventeen months. The Mexican government has virtually closed the case—despite international scrutiny it stands by the “historic truth” that they were murdered, burned in a garbage dump, and their charred remains thrown into a river. The disappearances of forty-three poor and indigenous teachers students attending a teachers college in Iguala, Guerrero forced us to recognize the crisis of forced disappearances long ignored by the Mexican government. It awoke the anger and outrage of a society accustomed to stories about violence and corruption plaguing magazine stands and daytime television. And it sensitized the country to its proximity to exasperating death and loss. On the night of September 26, 2014 the shootout allegedly perpetrated by local police left one student in a coma, six dead, twenty-five wounded, and the disappearance of the forty-three students. The details are horrific: the students were commandeering buses destined for Iguala, where they planned to secure more buses to later journey to Mexico City for the annual October 2 student protest, when police intercepted them. The police chased down the buses and opened fire on the vehicles, halting them to a stop. The unarmed students were forced off the buses and those who weren’t murdered or escaped were rounded up and put into trucks. One student, Julio César Mondragon, was tortured and killed. He was found dead with his eyes gouged out and the skin of his face flayed bare. It only took a few days for Mexico and the world to learn of those early details of the disappearances. Video clips, images, and testimonies of survivors went viral on social media and by October thousands of people in dozens of countries all over the world protested in outrage and solidarity with the families of Ayotzinapa. 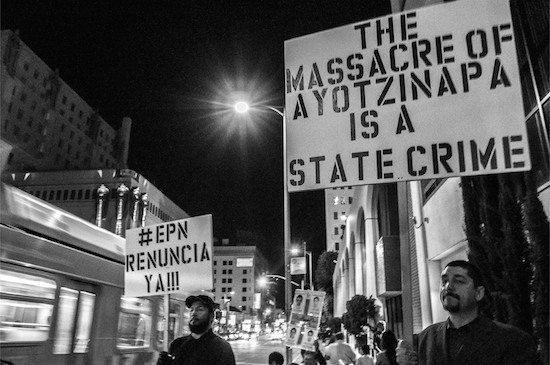 During the first global protest for Ayotzinapa on October 8, 2014 people joined the families in blaming the government for the disappearances. In Mexico City, artists like Café Tacuba’s Ruben Albarran, actor Daniel Giménez Cacho, and writer Elena Poniatowska joined thousands to march in a procession of outrage and deep sadness, carrying photos of the missing students. They demanded all three levels of government work to bring them home alive, demanding due process for those found responsible, and reparation of damages for the harm done to the families. In a press conference on November 7, 2014, the government released its official report—what then Attorney General Jesus Murillo Karam called the “historic truth”—that claimed that the students were delivered to the Guerrero Unidos cartel that killed them and incinerated their bodies in the Cocula landfill for over twelve hours. Their remains were put in bags that were thrown into the San Juan River. Not only were these remains not been delivered to the families but the report was also been scientifically disproven. In the last five months, both the Argentine Forensic Anthropology Team (EAAF) and Inter-American Commission on Human Rights appointed Interdisciplinary Group of Independent Experts (GIEI) disproved the Cocula dump theory. The GIEI team began investigations on March 2015 and six months later they released their first report that rejected, on scientific grounds, the government report that the students were incinerated in the Cocula dump. Their report also revealed that federal police were fully aware of what was happening, while it was happening, and did nothing. It also outlined the involvement of various police forces in the ambushing, arresting, shooting, and disappearance of the students. Their team emitted recommendations that called for the unification of the investigation into a comprehensive analysis of the facts. They also urged the government to continue the search for the students. The team’s request to extend their mandate to provide technical assistance for the investigation was approved and will end on April 30. In a press conference this past February 21, 2016 members of the group shared that in recent months they have faced a series of obstacles including illegal leaks to the press, diversion of information that puts in risk the progress of their investigation, and a smear campaign against the two women members of the group. The experts underscored the lack of government cooperation in the case. They claim that the Mexican government has purposely leaked statements by prime suspects that insist the students were burned in the Cocula dump. They experts remain wary of the government’s ability to see that there is justice in this case. ”Our mandate may end, but the precautionary measures [recommendations by the Inter-American Commission for Human Rights] that led to the creation of this body remain in force. Others can continue the effort to achieve full enlightenment, truth and justice,” group member Carlos Beristain said in the press conference. It’s now a crucial point in the investigation, where international pressure challenges Mexico’s historic reluctance to confront impunity in the name of the thousands of victims of state violence. 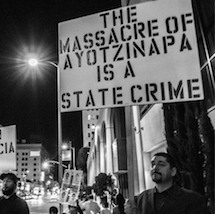 To date the Ayotzinapa case continues to highlight the Mexican government’s refusal to heed both domestic and international calls for justice. It has ignored the recommendations from even the highest international authorities on human rights. Last October the UN High Commissioner on Human Rights, Zeid Ra’ad Al Hussein, visited Mexico and issued a stark human rights assessment. In the press conference, Al Hussein urged the Mexican government to heed the GIEI’s recommendations and pointed to the importance of Ayotzinapa. 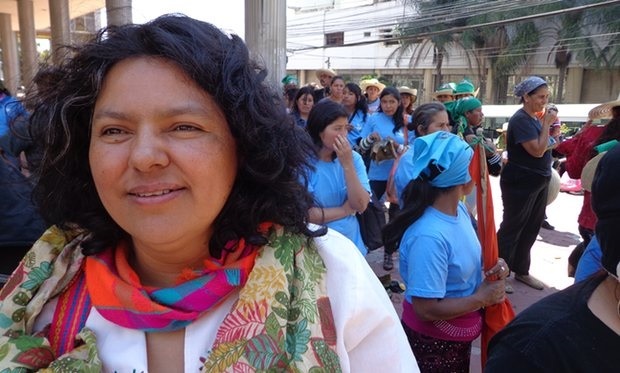 “The Iguala case is a microcosm of the chronic problems underlying the relentless wave of human rights violations taking place across Mexico. In particular, it highlights the prevalence of impunity and the disregard for victims that affect the entire country,” stated the High Commissioner. Just two days before the seventeenth month anniversary of the disappearances, President Enrique Peña Nieto made his first visit to Iguala to oversee the celebrations for national flag day. He took a break from leading the ostentatious celebration to applaud government efforts in the investigation. President Peña Nieto had refused to comment during first few days after the disappearance and even went on an international diplomatic tour during the height of the crisis. On Wednesday he applauded his government’s effort. “For one year and five months, the Mexican government has deployed an enormous institutional effort to pursue justice, starting with a profound, transparent and open investigation,” Peña Nieto said. However for the parents from Ayotzinapa, these haven’t been months of progress but of indifference. Vidulfo Rosales, lawyer to the families, explained it’s fundamental to clear up the doubts surrounding the case. Nearly 500 days after the disappearances, it’s to be known whether the Mexican government will get away with burying such a high profile case despite international scrutiny and deep societal pain. If this case remains unsolved it will be a message to Mexican society. A message to the families of the thousands of victims of feminicide, to the poor, rural, dissenting people that their lives are disposable. That the Mexican government will use impunity to disappear thousands and erase their memory, burying the disappeared twice over. A message that they will continue to mislead even in death and mourning, in a country void of truth, memory, and justice. As long as impunity and corruption continue to plague Mexico, where the most abominable abuses of human rights cases are swept under the rug and families are never to know the fate of their missing loved ones, Ayotzinapa will matter. Nidia Bautista is a freelance journalist currently based in Mexico City.